I love the car accident mistakes book!! "I love the car accident mistakes book!!" 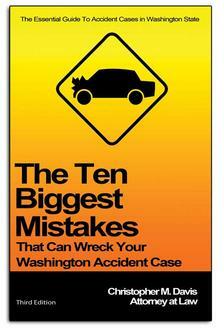 "This attorney wrote a book called 'The Ten Biggest Mistakes That Can Wreck Your Washington Accident Case' that helps people understand the insurance claims process after being in a car accident. I saw the commercial and I order the book. It is full of so much great information about how to handle the claims adjustor, negotiate with your insurance company, how to decide if you need a lawyer, etc. Very, very helpful!!! I think that anyone who offers that kind of valuable information for FREE should be thanked by the Seattle community. In my book that makes him a good lawyer and a great guy. If I am every in a car accident and end up needing a lawyer I am going to call Chris." "A Law Firm That Puts Their Heart Into Helping You" -Kim B. "Very good at paying attention to details and getting things done." -Rekha K.
"I am VERY happy with the way my case went. I would highly recommend the Davis Law Group to anyone who is in need of help." -Diane B.